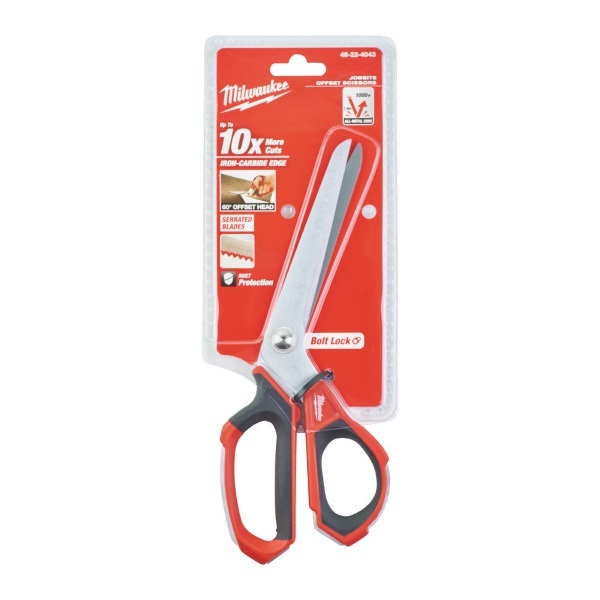 Milwaukee® Jobsite Offset Scissors redefine performance and durability in the scissor category. They feature micro-serrated Iron Carbide cutting edges for maximum durability and during tough cuts and better grip. They also include an all-metal handle loop design for protection from drops and handle breakage. An aggressive offset handle design keeps hands above cutting material. Bolt Lock Technology prevents blades from loosening to ensure precision cutting. For added precision, ruler markings are featured on the front of the blades.